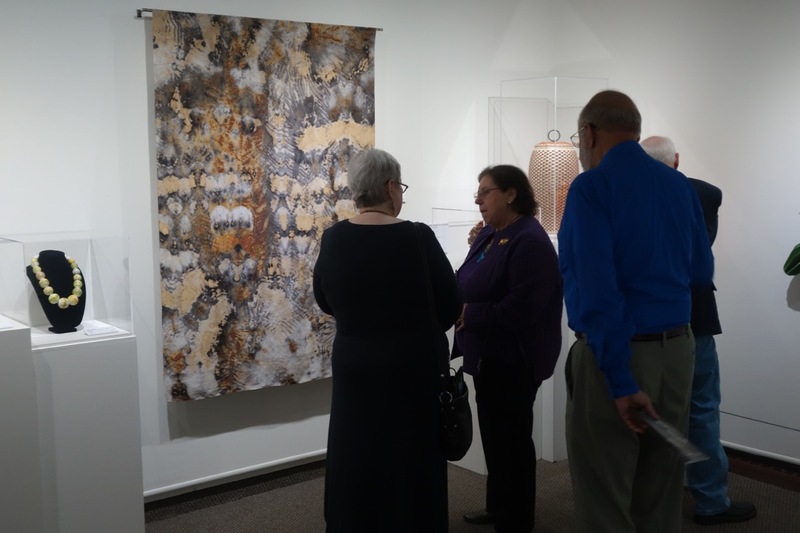 Edwardsville Arts Center kicked off their Holiday Show on Saturday Dec 1, and the exhibit will remain open with regular gallery hours until after Christmas. I delivered a nice selection of scarves and shawls to this show and forgot to advertise until now! All are for sale. If you are shopping for the holidays, do go and check it out. Support real artists and craftspeople when you can. My shibori rust scarves are featured alongside a few other fiber artists, lots of pottery by several different artists as well as paintings, photographs and jewelry. All price points! Altogether over 30 local artists will have one-of-a-kind, handmade gifts for sale, ranging from jewelry to pottery, scarves to winter paintings, and much more! After purchasing a gift, you’ll have the opportunity to create your own wrapping paper and package your gift, making it a truly personalized present! I am honored to have been invited to participate in this exhibit with renowned potter Arthur Towata and Eastern Illinois University professor and sculptor Ann Coddington at the Jacoby Arts Center in Alton, Illinois. Residual impact explores our interconnectedness to the environment, the imprint we leave in nature and somatic memory. It hopefully inspires reflection and encourages the protection of our natural resources. 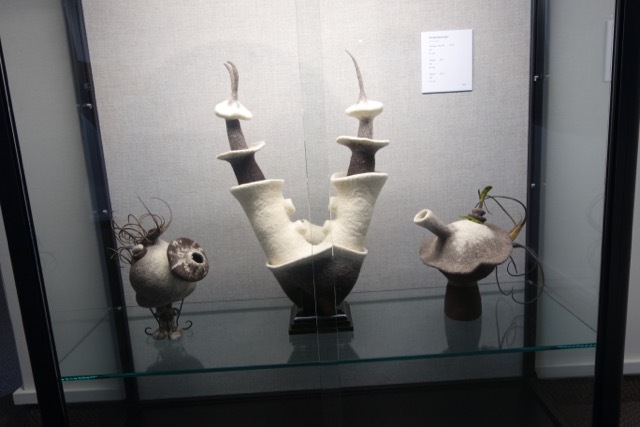 I have eight large pieces in this show which are beautifully balanced by remarkable knotted and netted sculptures by Ann Coddington and the incredible textures and shapes of Art Towata's pottery and paintings. 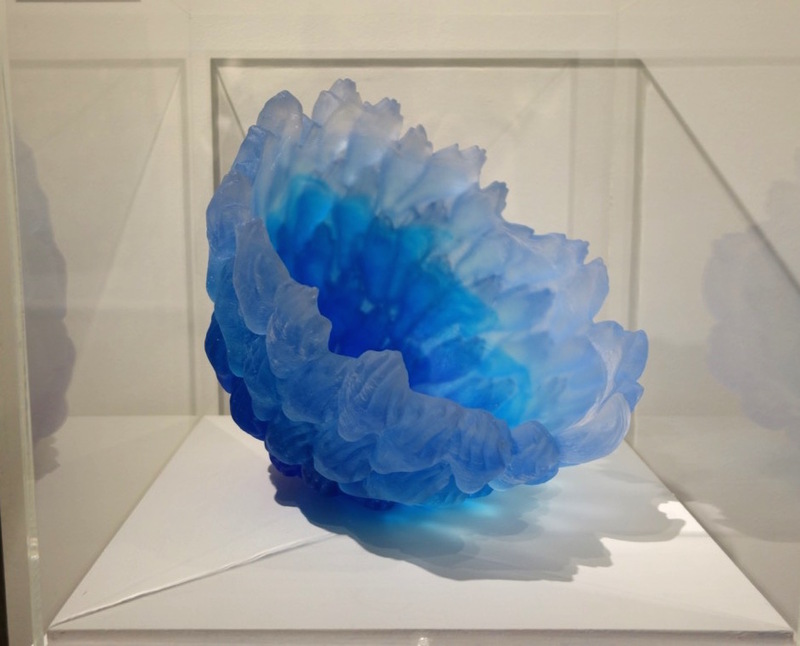 The show is gorgeous and thanks to curators Sun Smith-Foret, Penny Schmidt and Jane Sauer, who brought us together, it is the first time in many years that I've been given the opportunity to "speak" to my environmental concerns within a show devoted to same. I've included my statement below. Ann Coddington's netted piece (title ?) in foreground. Broader view rear of gallery with a sample of all the artists' work in view. 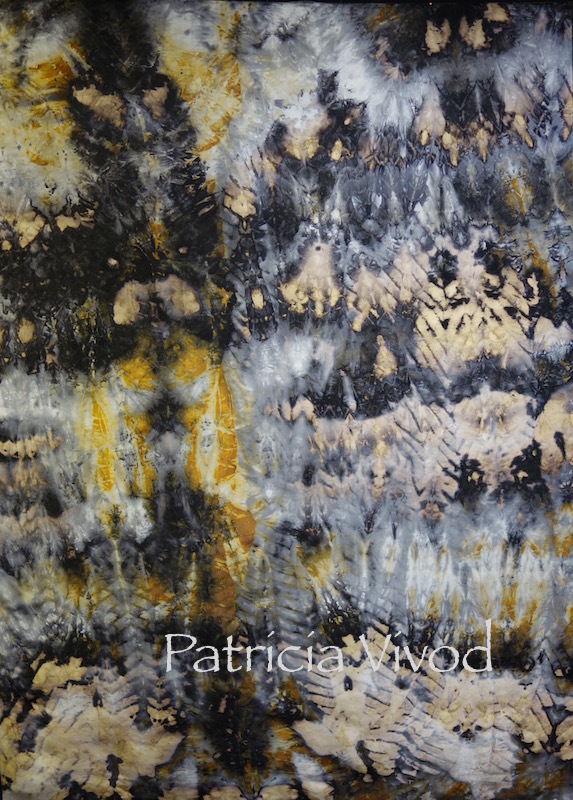 As a printmaker over 15 years ago, I experimented with fabric to lift prints from rusty farm tools. It was love at first sight! 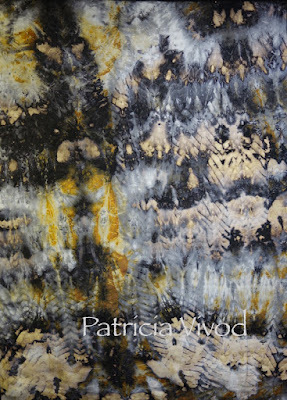 I embraced organic printing, as I called it, because it inspired spontaneity and informed my ideas about process and content. 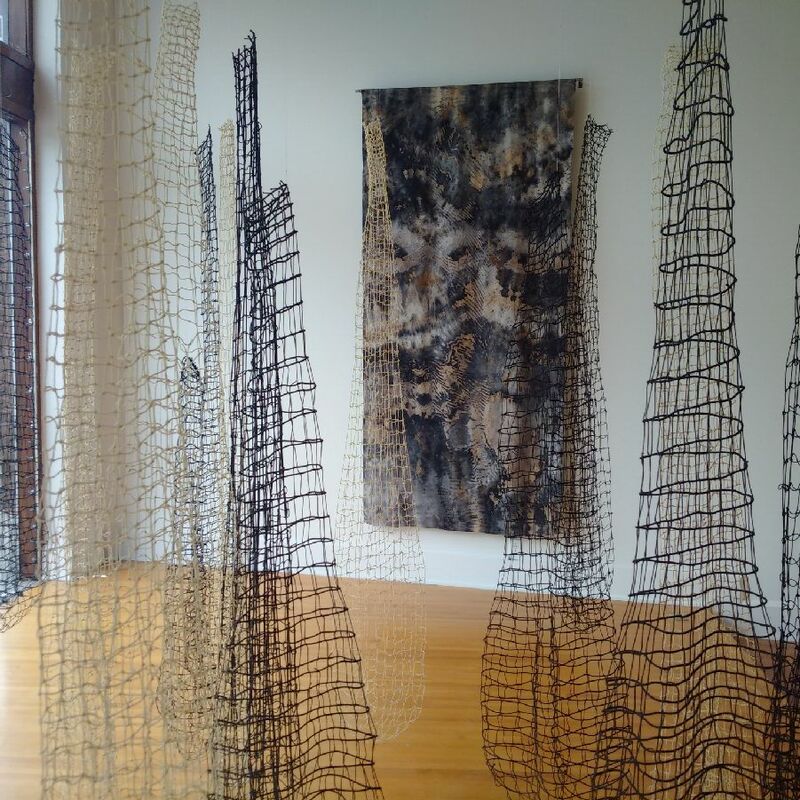 Treating fabric as a vast landscape, I adapted arashi shibori techniques to wrapping rusted pipes, tucking leaves into folds to create additional resists. 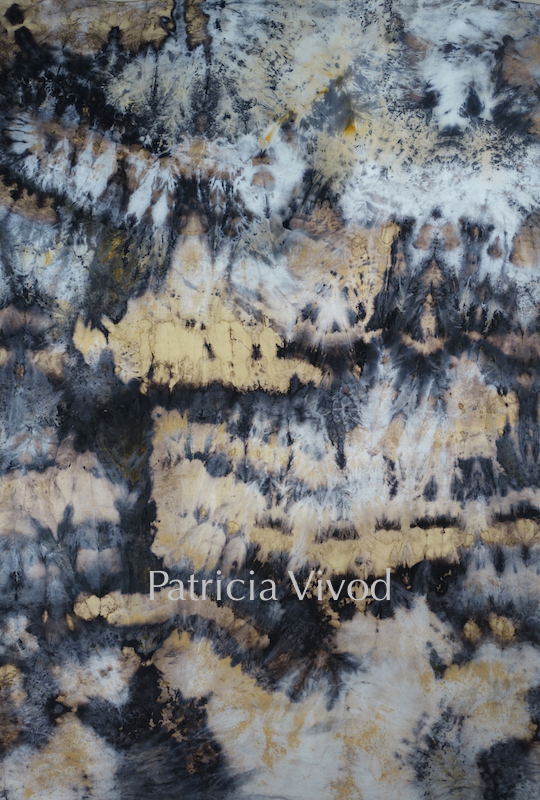 I prefer to work with silk because it is beautiful and deceptively fragile, but capable (to a point) of surviving the assault of rust printing. 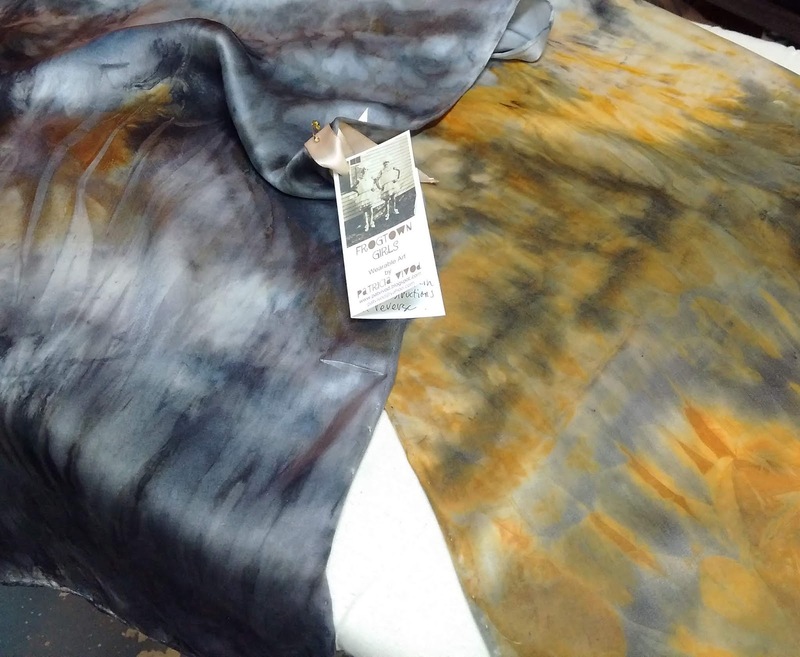 Rust is a gorgeous medium, offering an array of colors and exciting, unpredictable patterns when tempered by tea and tannins that defuse the corrosive power of the rust resulting in permanent and stable marks on the fabric. This unsettling recipe of rust and silk goes beyond mere design, however. It is a fitting metaphor for both the fantastic beauty of our earth and the assault on the environment that we are perpetrating to our own detriment. On Saturday, October 21, starting at 2 pm Ann Coddington and I will be participating in a gallery talk with demos that I hope will bring that statement to life for those in attendance. If you click on the showcard above with text, you can read a brief statement of Ann's. Arthur Towata has been making pottery for many decades. 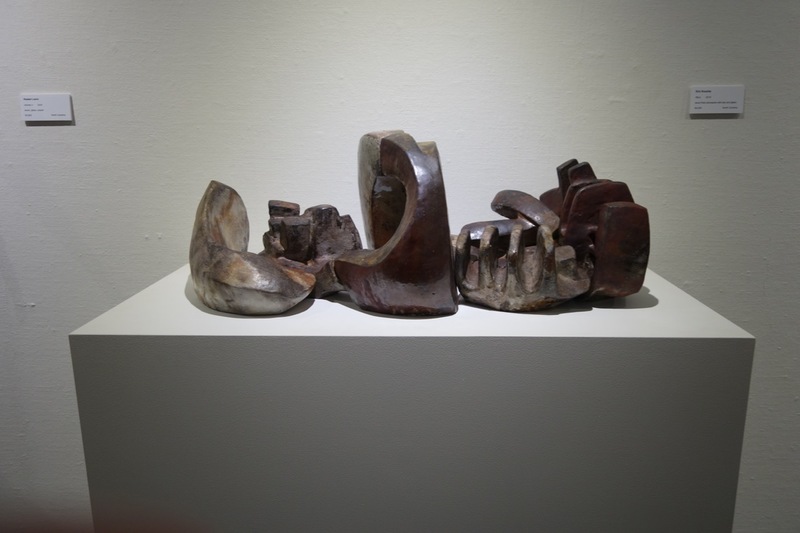 His work is the embodiment of his experience defined by the environment that surrounded his forced internment as a child during WWII at Manzanar. On Friday evening, Oct 20, beginning 7:30, after the main gallery artist reception, there is a special event Hidden Histories with films and discussion on the Japanese internment camps where Arthur can share his very personal experiences. 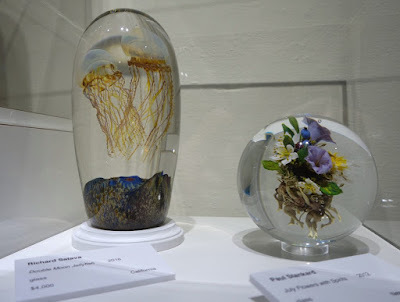 More photos of the exhibit can be found at the exhibit page for JAC here. 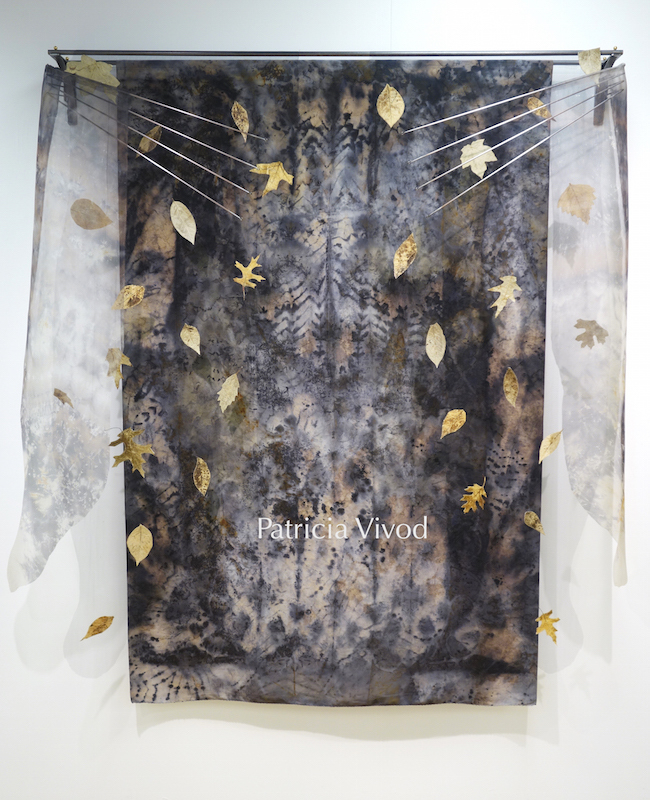 I was also invited to populate the gift shop at Jacoby with a number of new scarves and wraps that I've been making such as this very large sheer silk wrap in which I incorporated elderberries. The Jacoby Arts Center is located at 627 East Broadway, Alton, Illinois 62002. 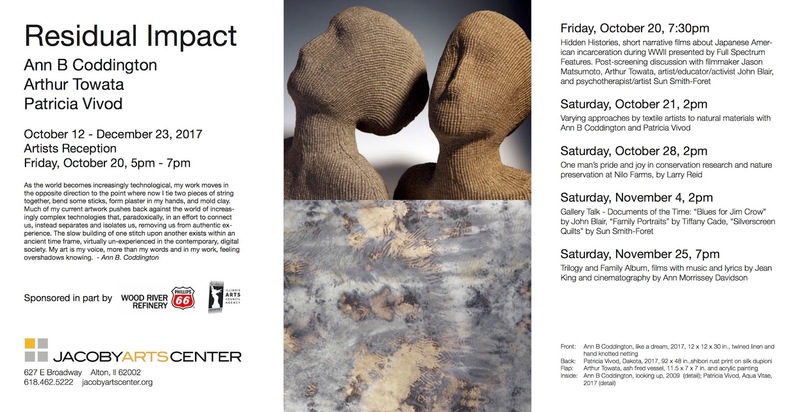 Please visit the website for more information about Residual Impact and the concurrent exhibits in the east gallery as well as other events associated with the shows. The Biennial is open to artists in Illinois south of I-80, and the metropolitan regions of St. Louis, MO, Evansville, IN, and Paducah, KY. They award great prizes -- so fingers are crossed. My piece (left), The Devil Is in the Details, was accepted into the show. I'm in good company--several local friends are also in the show. In all there are 60 pieces in the show by 54 artists juried from a pool of 140 artists and 383 entries. 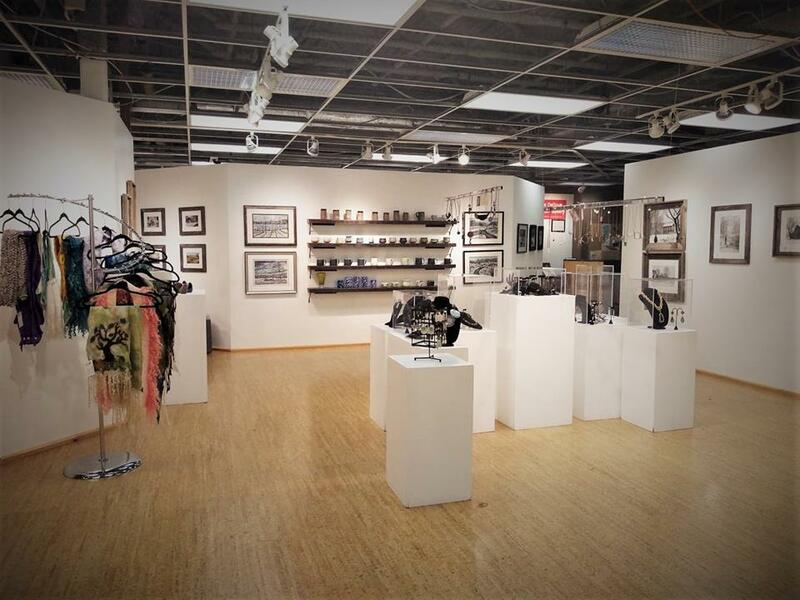 Cedarhurst is situated in the midst of a sculpture park at 2600 Richview Road, Mt. Vernon, IL. I can't tell you how thrilled I was to be able to attend the opening of this exhibit at the Art Museum for Greater Lafayette. Altogether about a 4 hour drive for my husband and I, but we did combine the trip with a visit later to a dear friend who lives in Indiana about 2 hours south of Lafayette. When we started looking for a hotel close by the museum, we discovered that Purdue University was holding graduation ceremonies the same day as the opening, so rooms were going for premium prices and we opted to stay in Crawfordsville about 27 miles to the south on Rt 231. I recommend the Best Buy that is just off I-74. Very nice room. Cracker Barrel is conveniently next door, so we grabbed an early supper there before changing and driving up to Lafayette for the opening. I had the route memorized from the delivery trip in April, but the museum is easy to find. Kathleen Nowak Tucci's (Alabama) pieces on either side. 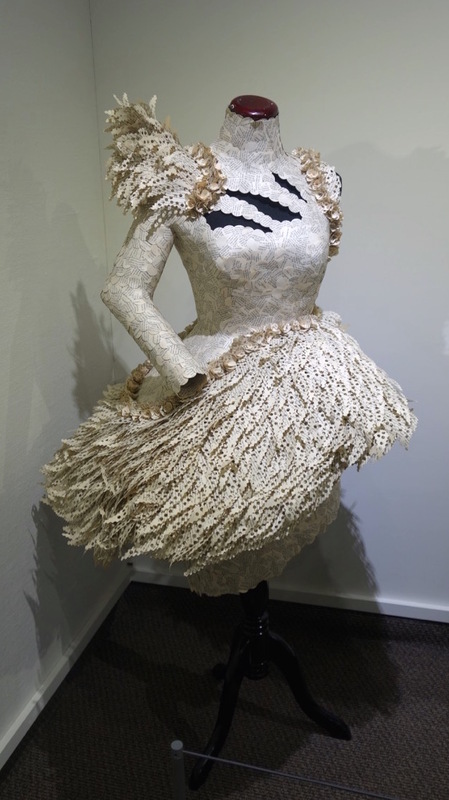 Scroll down for another shot of her work. The exhibit features 140 works by 51 artists from 25 states, Australia, and Canada spread over 2 galleries in the museum. A full color catalog was created that has photos of all the work plus artist websites which I've been exploring day by day since I received mine. 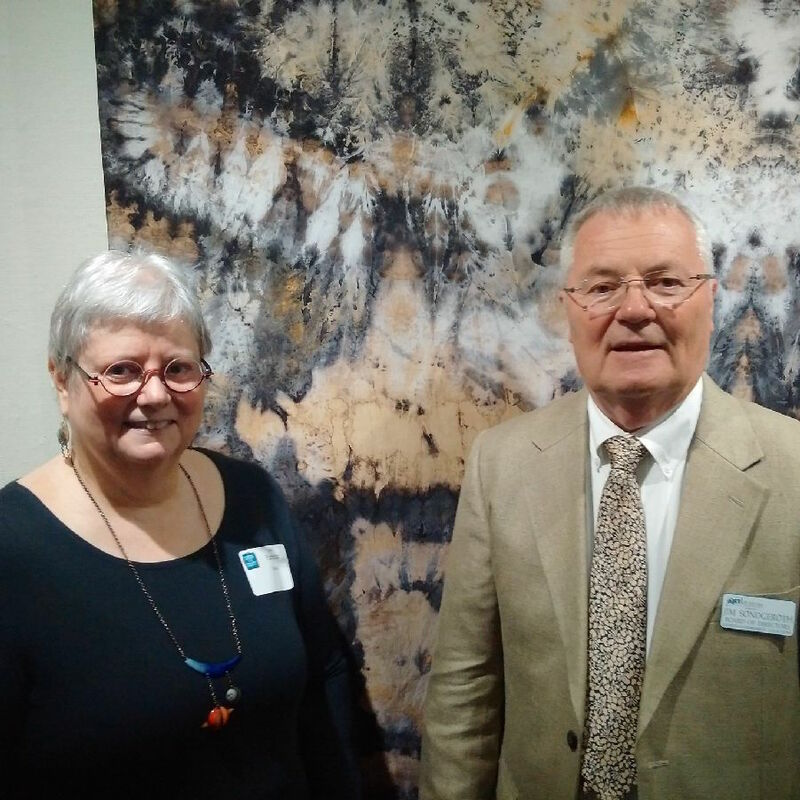 Jim Sondgeroth pictured left was the guest curator. I had lunch with him the day I delivered work and learned that like me, he taught high school art for many years. He serves on the board of the museum. Jim personally selected all the artists for this exhibit and the previous two held in 2011 and 2014. I'm very proud to be included in this one... and very happy to say I've been invited back for the 2020 show. 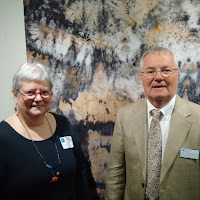 On the day I delivered my work I met Jim and Michael Crowthers (left)who is the museum curator and installer of the exhibit. Michael did a phenomenal job in arranging the exhibit. I couldn't be more pleased with how my work was showcased. 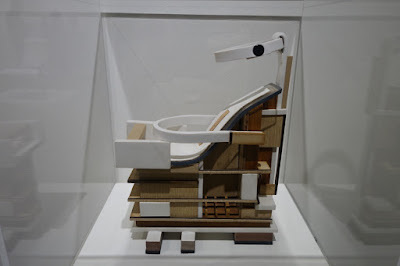 This exhibit is stunning both in the calibre of the work and the diversity of the mediums. 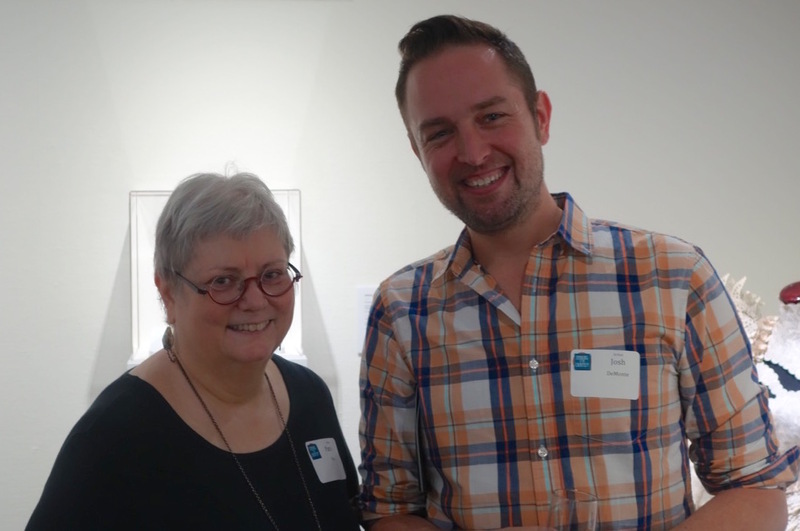 There were six artists I think at the reception including Joshua DeMonte (below) who came all the way from Maryland. Joshua was a delight to meet and talk to. 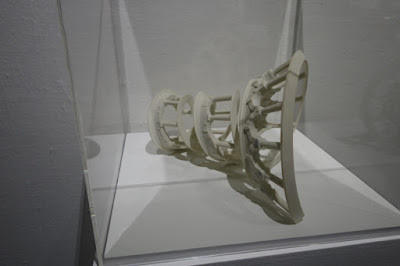 He attempted to educate me about 3-D printing which is his medium now (he is a metalsmith). He teaches at Towson University. 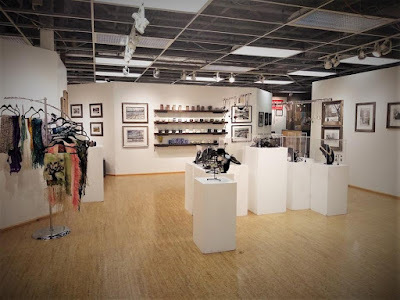 For additional information on the show and a complete list of the artists plus individual images of my work, see the post I did announcing the show here. Following is some of the work I photographed while at the reception. 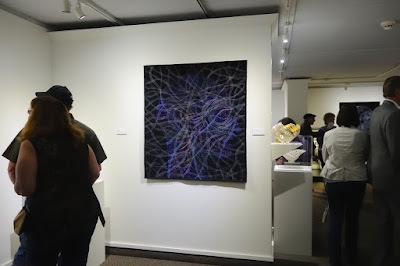 There were a few other artists working in fiber or using fiber techniques with non fiber materials such as Brooke Marks-Swanson / Indiana, who I met, but forgot to photograph her work. She does striking large scale wearable adornments/jewelry using hand knit leather combined with silver and gold. Kate Cusack / New York, does equally striking wearable neck pieces using zippers and thread. 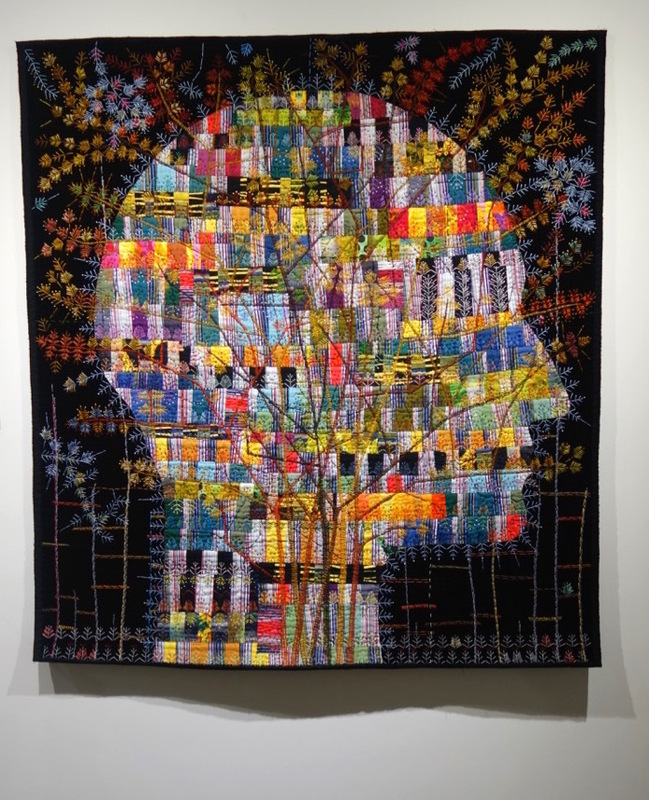 Jill Ault / Michigan had three stunning art quilts in the show using digitally printed cotton to create optical effects. 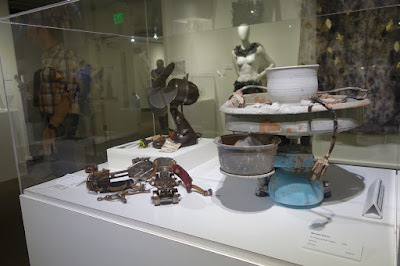 Geoffrey Gorman's rabbit, below left, utilized fabric that is rusted over time by the wires that bind the fabric to the form. I saw Gorman's work at SOFA Chicago a few years ago. 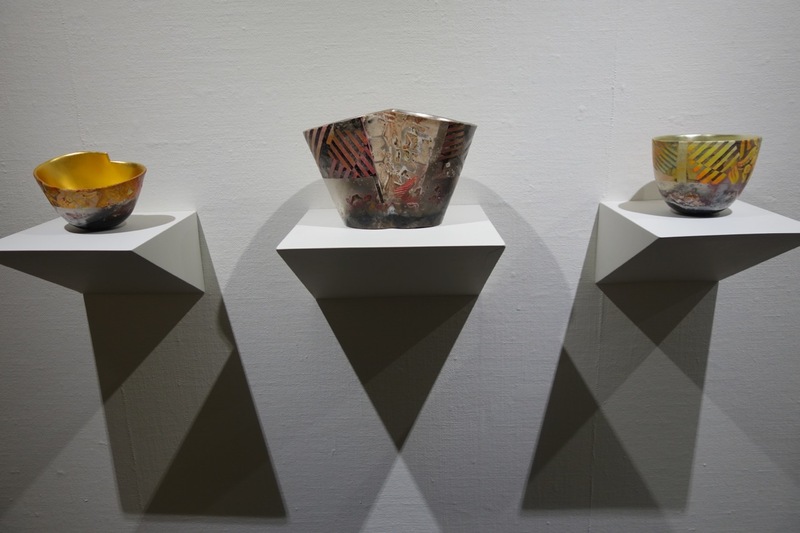 Glass, ceramics, wood, leather and furniture and jewelry made up the rest of the show. I couldn't begin to capture everything, but here are a few more highlights. 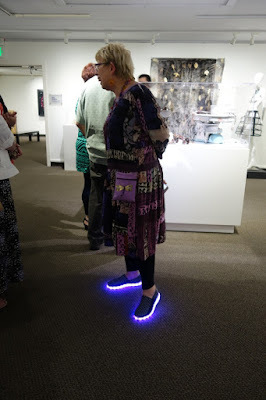 FYI: I had the permission of the curator and director of the museum to photograph. 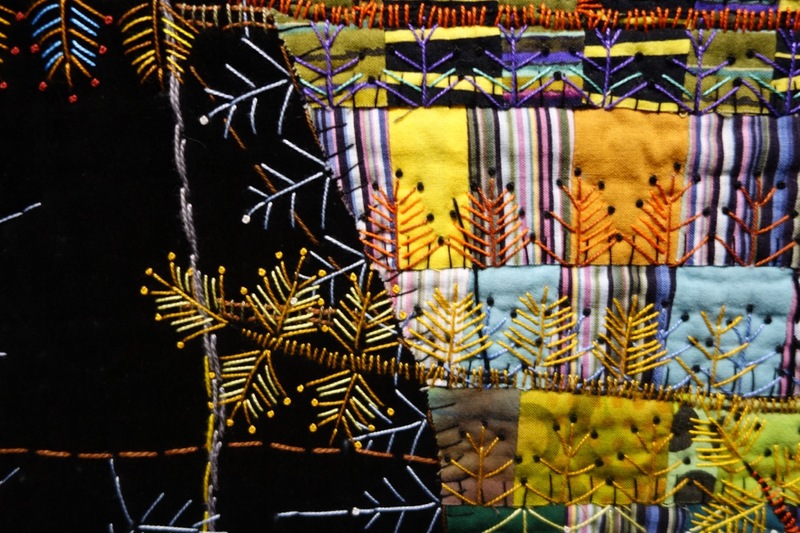 I am absolutely thrilled to be included in the invitational exhibition -- Making It in Crafts III -- May 12 to August 27, 2017 -- at the Art Museum of Greater Lafayette in Indiana. 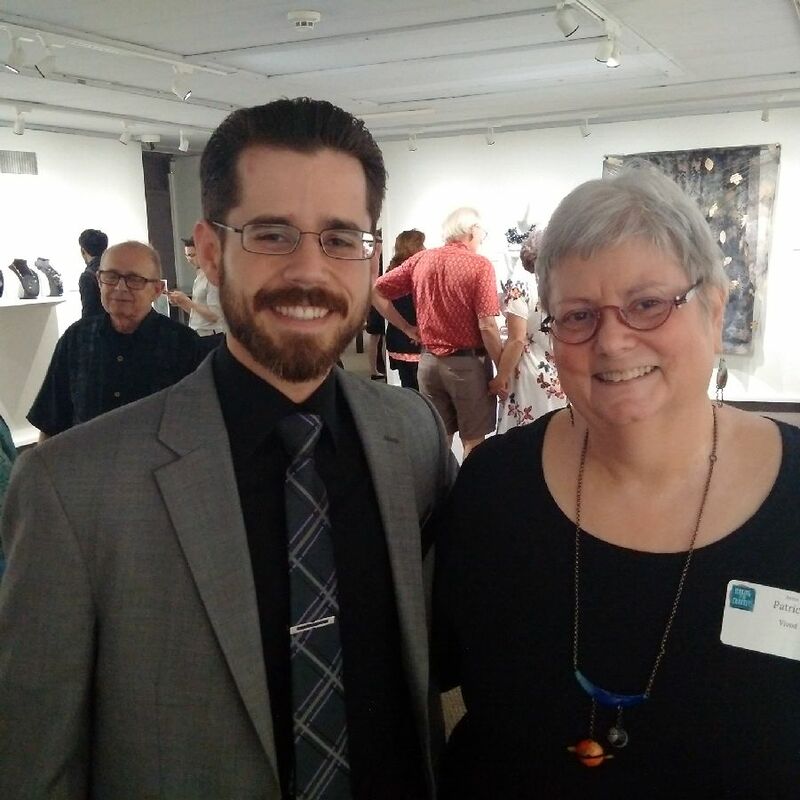 I delivered three pieces in person last Tuesday and met the guest curator, Jim Sondgeroth. 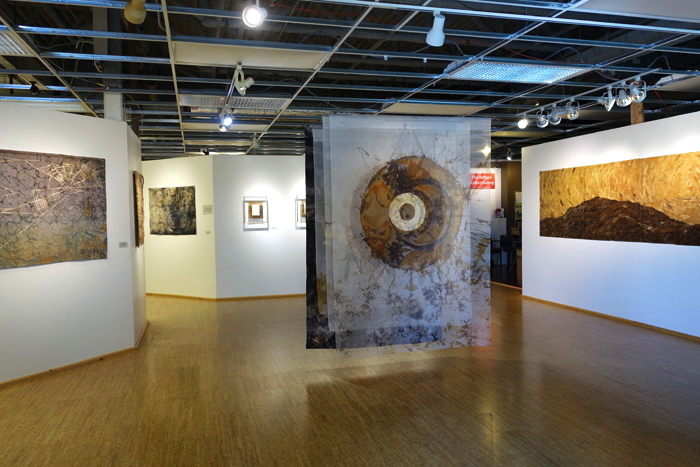 The opening reception is Friday, May 12 from 6:30 to 8:30, with remarks by Jim Sondgeroth at 7 pm. processed leaves, 68" x 60"
Making It in Crafts III features 140 works by 51 artists (clay, glass, metal, wood working and fiber) from 25 states plus Canada and Australia. I'm in very good company. From the looks of the catalog, the show should be stunning. 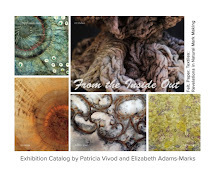 You can get a peek at some of the other artists' on the brochure posted on my Exhibitions/Events page. Shibori rusted silk dupioni, 66" x 48"
This exhibition will feature 140 works of art by 51 prominent professional craft artists (clay, glass, metal, wood-working and fiber), from 25 states plus Canada and Australia. 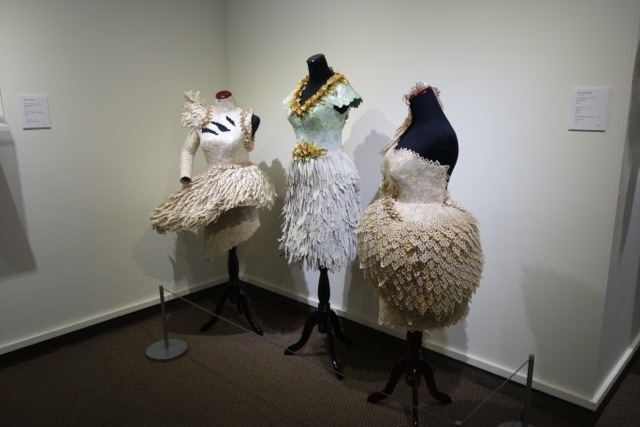 These artists make their living by creating and selling fine art crafts. 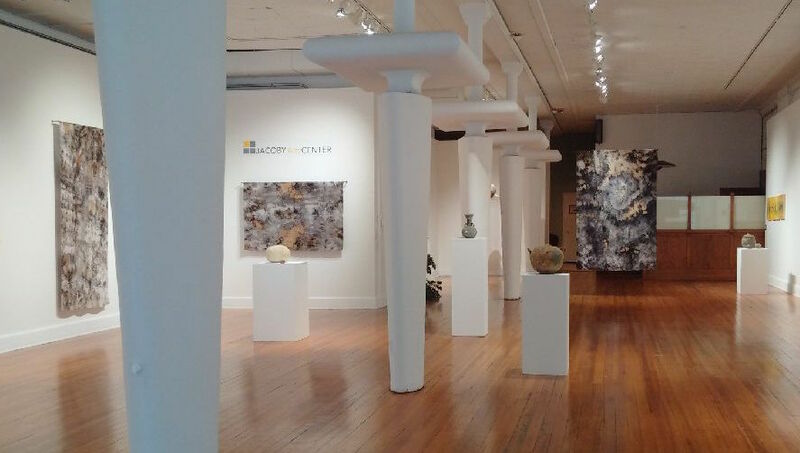 Many of the most renowned artisans are juried participants in the most prestigious art shows in the U.S. 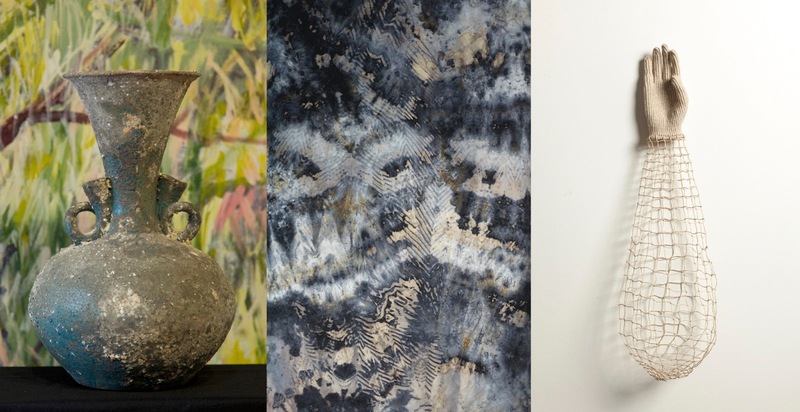 Including Chicago’s SOFA at Navy Pier; Grand Rapids’ Art Prize; and Ann Arbor’s Summer Art Fair. 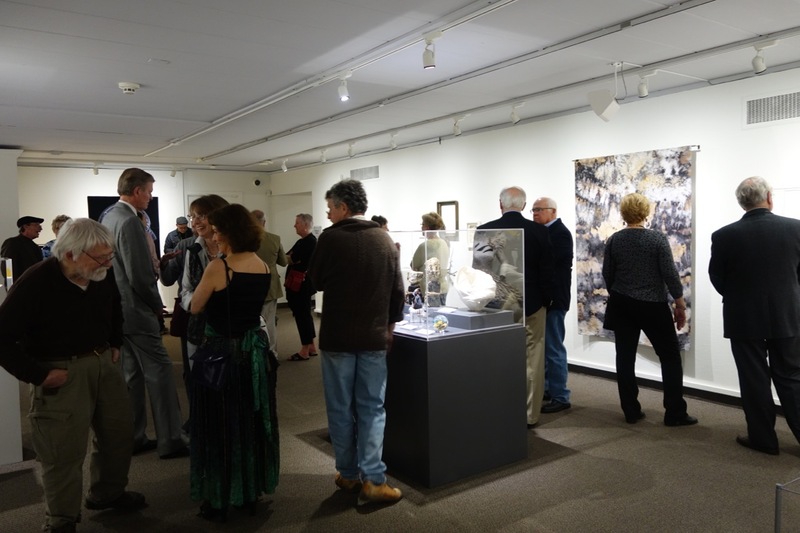 Guest Curator, Jim Sondgeroth has personally selected and invited each artist. This unique exhibit expands on the first two Making it in Crafts exhibits shown at the Art Museum in 2011 and 2014. 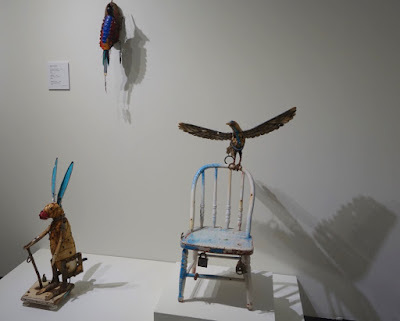 It is one of the most exciting and comprehensive arts and crafts shows to be presented in the Midwest. Can't believe it is 2017! Time to show off the first finished piece of the season. This is a small piece for me, only 24x12, the silk is mounted on a canvas stretcher that I covered with felt first, to round off the sharp edges and corners and cushion the silk. It started out as a scarf that failed to print consistently and the striking rust pattern went a little too far for comfort to use as a wearable so I cut off the portion I liked for mounting. 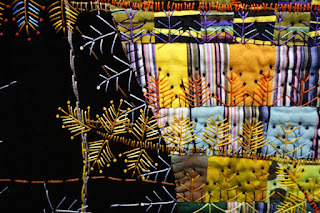 The silk was wrapped around to the back of the frame and stitched to the felt. The title comes from the trivets at the top of the image. I've been collecting the trees for some years now in two sizes...I've got several. My latest acquisition was found when I was Christmas shopping and has a mark on the back that I don't recall seeing on my other trees. It shows more detail on the front than some of the others too, so I'll have to compare when I get back out to my studio. It's way too cold now to go rummaging around. So much of what passes for antique is really reproduction, but if it's decorative and will rust for my purposes, who cares. A problem I often run into when searching for suitable rusting sources is that dealers often use paint or polyurethane to prevent or preserve rust. More and more people are buying up iron to decorate with. In fact a whole industry has sprung up. Rust is a natural and beautiful patina...why would anyone want to mess with it? Leave it alone I say. Let the buyer decide. One of the trees didn't print as well as the others--design wise I love the varied effect, but the color glitch could be caused by any number of problems including having vestiges of some polyurethane on the surface that I failed to remove. My trees all look rusty but there might be a patina building up that makes it difficult to get a decent print. I may need to do some wire brushing ahead of any new work. This piece is in an exhibit and for sale at The Edwardsville Arts Center through Feburary 3, 2017. I don't much care for chiffon because of the crepey texture. But while looking for something to work with recently (I was temporarily out of dupioni), I decided to use up some remnants I had stashed. 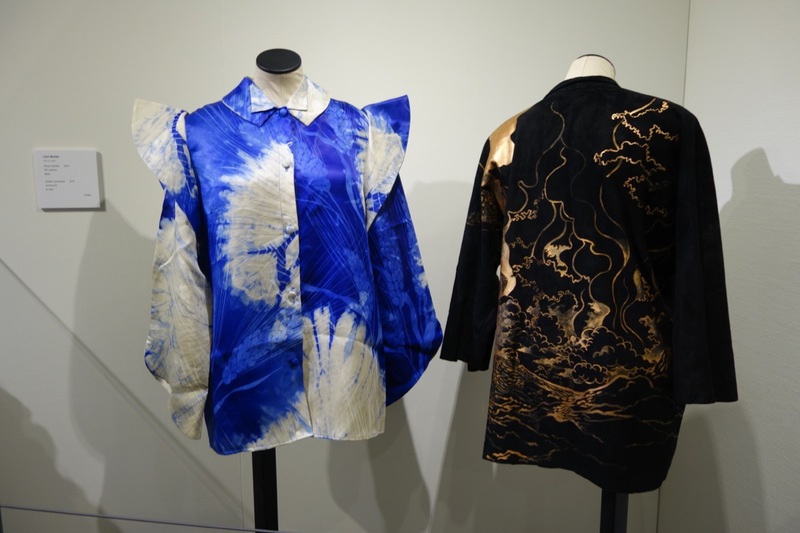 The drape and weight of chiffon allowed the fabric to be manipulated into tiny folds and swirls so there is lots of movement in the design and small details. I also used new string so as to create resist marks rather than prints as happens when I reuse string that has soaked up tannins. Iris leaves created additional resist and I soaked the fabric briefly in water rather than vinegar before starting. Tea leaves, and cheap wine were used in the process of setting up the design. When I checked on the fabric several hours later, I feared not much was going on, so splashed some vinegar on the top side of the pipe and left it overnight. In the morning I was rewarded with some blackened areas. 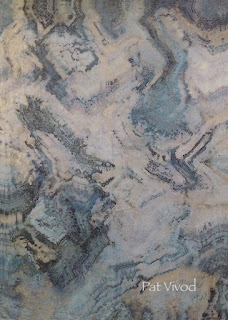 Overall the color is much less dramatic than my dupioni work but I quite like the soft result. It is very likely also related to the cooler weather. It may be difficult to detect here, but the darkest areas have a definite greenish cast to them. There is very little actual rust showing. 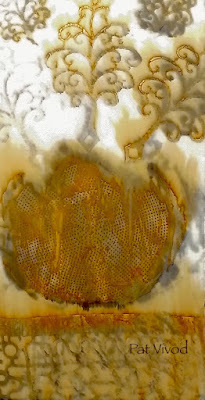 The chiffon was photographed against a black background. White washed it out. This blog belongs to Pat Vivod, a farm girl at heart, former teacher, cat lover, mystery reader, ice cream eater, procrastinator, TV watcher, best friend of the model for Field and Stream, printmaker and textile artist. BTW, Vivod rhymes with peapod. WE ARE PUBLISHED! Click here to go to Blurb to preview or purchase. It was a wonderful show while it lasted. I grew up on a farm, so it is partly in homage to my father and partly in humor that I refer to my process as reverse farming. 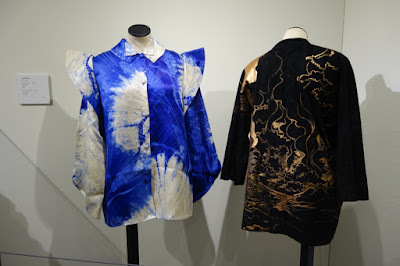 Harvested plant materials paired with rusted iron objects (often old farm implements) makes possible a wide variety of virtually permanent color marks on silk through direct contact printing. 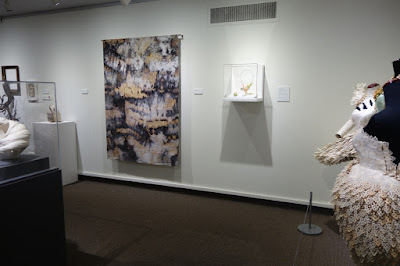 Since 2007, I have adapted shibori techniques to broaden the scope of my landscapes and farm stories which develop organically--outdoors, where, as in real farming, the season, temperature, humidity and timing affect the outcome. I have worked hard to create this growing body of work. Please respect my art. Unless otherwise noted, all images and text on this blog are copyright Patricia Vivod. Reproduction of any kind is expressly prohibited without written consent. One Week from the Opening ... Let’s Teach a Workshop! 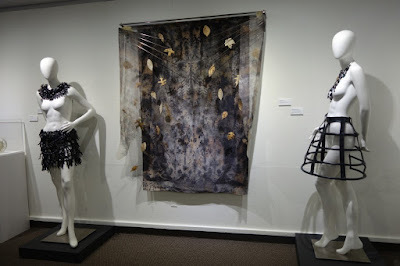 The St. Louis Beacon featured my interview for Innovations in Textiles in 2011 here. Please respect my work. 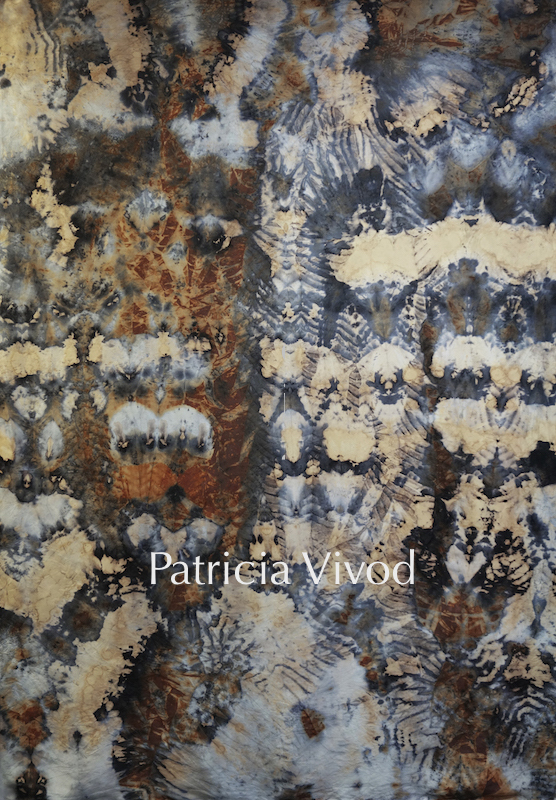 Unless otherwise noted, all images and text on this blog are copyright Patricia Vivod. Reproduction of any kind is expressly prohibited without written consent.